Wildfires can become so intense that they produce thunderstorms. This phenomenon of fire-triggered thunderstorms is called pyroCbs, which is short for pyrocumulonimbus clouds. 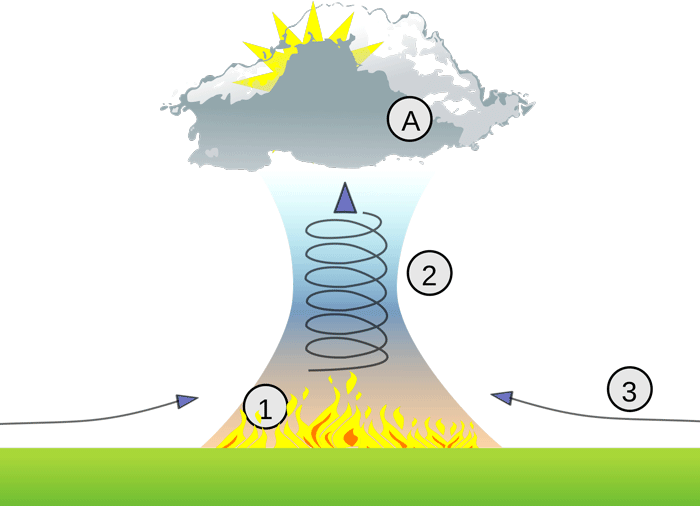 While the exact physics behind these fire-triggered thunderstorms is still unclear, pyroCbs are triggered by the uplift of ash, smoke, and burning materials via super-heated updrafts. As these materials cool, clouds are formed that behave like traditional thunderstorms but without the accompanying precipitation. These pyroCbs produce dry lightening which can trigger further wildfires. Scientists are studying how climate change, which is driving larger and more intense wildfires, are also creating a higher frequency of pyroCbs. Fire-triggered thunderstorms are being generated in places that have never experienced this phenomenon before such as Texas, Portugal, South Africa, and Argentina. pyroCbs are particularly destructive due to the tornado-strength vortexes that are produced.